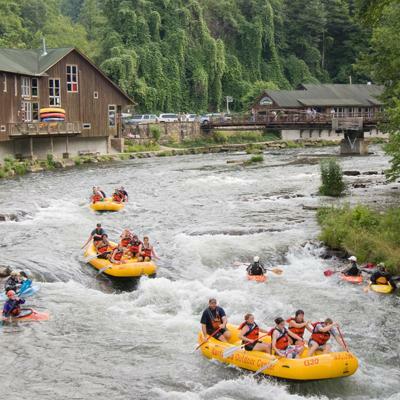 Located about a dozen miles west of Bryson City on US 19/74, the scenic Nantahala River ranks among the most popular whitewater rafting rivers in the country. Without a doubt, it is the most popular in the Southeast luring more than 200,000 paddlers to its waters every year. A perfect combination of exciting whitewater and placid pools, the Nantahala is a great introduction to the sport of whitewater paddling. With Class II and III rapids, it’s considered a “family” river suitable for senior citizens and children — providing the kids are at least 7 years old or weigh at least 60 pounds. But, don’t get the wrong idea. Just because the river is suitable for families doesn’t mean it’s not exciting. It’s also challenging enough for the US Olympic Kayaking Team, which often trains on the Nantahala. Nantahala won “Best Paddling River” in the Blue Ridge Outdoors 2016 Best of the Blue Ridge Awards. In the mood for something more sedate? Try the Tuckasegee River. With its Class I and II rapids, Tuckasegee rafting trips provide great outdoor entertainment for the entire family. (including kids as young as 4 or weigh at least 40 pounds). The Cheoah is a nine-mile stretch of a narrow, whitewater river located outside of the mountain community of Robbinsville, west of Bryson City. It begins below Santeetlah Lake Dam, parallels Hwy 129 and finishes at Calderwood Lake. The Cheoah is a controlled-release river with a very limited number of release dates. It has continuous Class IV – V rapids. Dropping 150-feet per mile, the Cheoah is 3x as steep as the Gauley. Check with your outfitter for times. The Ocoee has been rated one of the ten best whitewater rivers in the country by Canoe Magazine. A number of these outfitters also take trips down the Ocoee, about 1-1/2 hours southwest of Bryson City. It has been chosen as the site of national whitewater championships on several occasions as well as home of the 1996 Olympic Whitewater competition. Fully guided due to the challenging water. More fun activities on he water near Bryson City. Offers whitewater rafting on the Nantahala, Cheoah, and Ocoee Rivers. Ocoee rafting package includes transportation from our Nantahala Outpost, saving you the extra driving. Kayak instruction from the beginner to advanced level and kayak/mountain bike trips to Costa Rica and Ecuador. Lake touring offered for half-and full-day trips. Also, fly fishing instruction & guide service with drift boat option. For almost 40 years Rolling Thunder River Company has provided high quality, fun filled rafting experiences, with over 1 million guests choosing to raft and stay with us. Choose guided, follow a guide or non-guided/ rental trip options. We offer hot showers, campground, and a bunkhouse which sleeps up to 65 people. Family owned and operated with a caring staff. Open April - September. 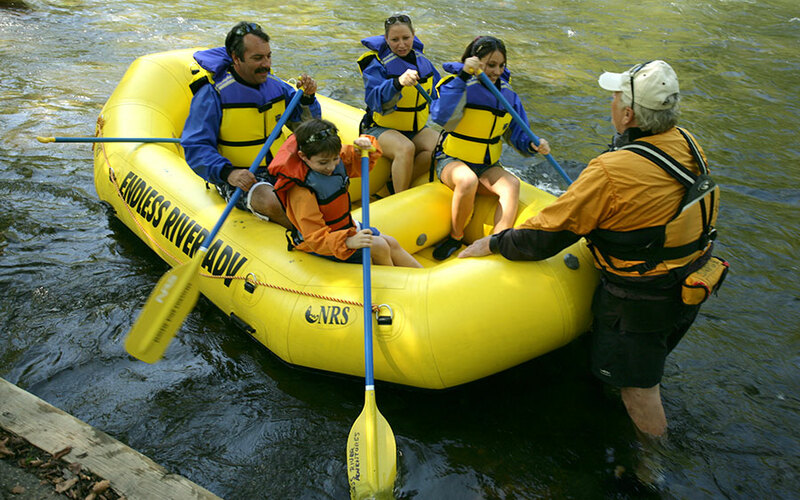 Offers Guide-in-Boat, Guide Assisted, or Non-Guided whitewater rafting trips on the popular and scenic Nantahala River. Inflatable Funyak/Ducky rentals. Excellent equipment, friendly staff, and comfortable facilities. Great low prices and group rates available. Combine our rafting with gemstone mining, horseback riding, and scenic train tours. Fully furnished vacation rentals available. Convenient to all area attractions. Fully guided and rental inflatable kayak and raft trips available. A family-owned business since 1971, Wildwater runs on the Nantahala, Ocoee, Pigeon, and Chattooga Rivers. A complete adventure destination-Zipline Canopy Tours, half-day Jeep® Tours, full-day Rails & Trails, and Raft & Rail© since 1988. Wildwater offers 100% quality service guarantee. On site lodging in unique Yurt Cabins or economical Group Lodge at our Falling Waters Adventure Resort. WIFI for guests. Offering exciting and enjoyable whitewater activities for families and groups since 1979. Featuring excellent equipment and a courteous, professional staff and very reasonable rates. We invite you to come and enjoy the river in one of our self-bailing rafts or funyaks. For the inexperienced, we offer guide-assisted or fully guided trips. Contact us soon and join the fun!! Nantahala Outdoor Center’s main campus is located at the intersection of the Appalachian Trail and the Nantahala River, just outside Great Smoky Mountains National Park. A mecca for outdoor enthusiasts since 1972, NOC’s 500-acre adventure campus boasts plenty of excitement to keep your entire group happy and active, whether you spend the day or a week! Whitewater raft, zipline, mountain bike and hike, and explore Lake Fontana in a rental kayak or SUP. In between adventures, check out NOC’s two riverfront restaurants, onsite shopping, and spend the night in a cozy trailside cabin! 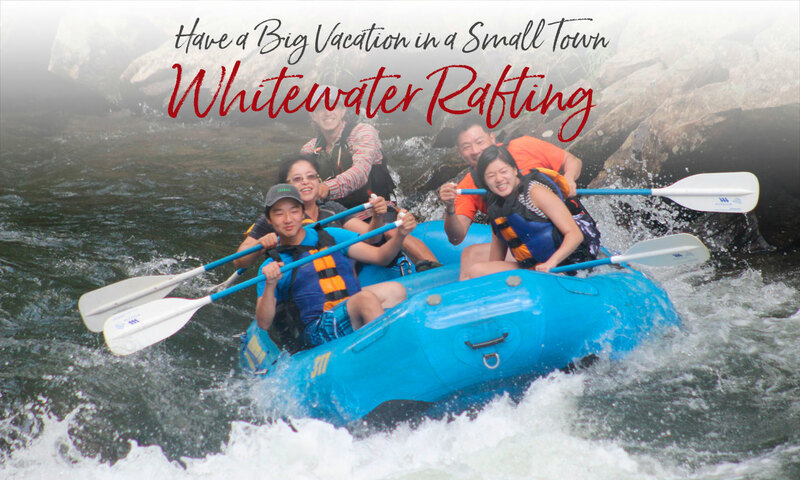 Experience the beauty and adventure of whitewater on the Nantahala River. We are family owned and located directly on river. Our specialty is giving economical prices with the very best in personal service, equipment, facilities, and staff. No experience necessary. Guided & unguided trips available March through October. Walk-ins are welcome or call to reserve your adventure. We look forward to seeing you on the river with us. We offer guided, guide assisted, and be your own boss (Rentals.) We have Funyaks, Pumas, Self Bailers and regular rafts. Enjoy our riverfront cabins, RV sites and group tenting areas. We want to share our passion for the river with you and we take pride in our customer service. You are our number one concern. Near Bryson City, open April-Nov. Also open by advance reservation Nov. - April. Raft with kids as yound as age 4. No weight limit. Guide assisted half day rafting trips on class I and II whitewater. A great trip for families with younger kids and for beginners. Outfitters provide paddling tips and safety instruction. All outfitters provide approved life jackets; most outfitters will provide a wet suit and/or paddling jackets during the cooler months. It’s advisable to wear a bathing suit or shorts and tee shirt, and secure shoes. If it’s cool, you should bring wool socks, a hat and sweater. Watches and loose jewelry should be left behind. And eyeglasses should be secured with a head strap. You should also bring towels and a change of dry clothes.